At nine years old, Elijah Roberson realizes just how fortunate he is and how hard his father, Jackie, is working to provide him with a good life. "We're just looking to maintain and figure out how to get through this period," Jackie Roberson said. Roberson is a single-father. He is struggling to make ends meet. Last year, he moved out of his Elmwood Village apartment, to his mother's Masten Avenue home. He's working to save money and pay off $140,000 in undergraduate and master's degree debt. At the same time, he's paying for summer and after school childcare for Elijah. "Childcare is very expensive. It's very costly and people who are having children are just trying to make it," Roberson said. Jackie doesn't qualify for grant money doled out by the federal government to states and counties. He makes too much money in his full time job. A family of two would qualify for this subsidy if they had an income at or below $32,920 per year. Each county pays the childcare provider directly, based on the family need and type of care. There is less money available for people who live in Erie County than counties of similar size. The Western New York Women's Foundation reports, there are nearly 280,000 people in Erie County living at or below 200% of the federal poverty line. If each of those people used the subsidy, there would only be about $90 available per person, compared to $160 in Monroe County, $257 in Nassau and $122 in Suffolk Counties. 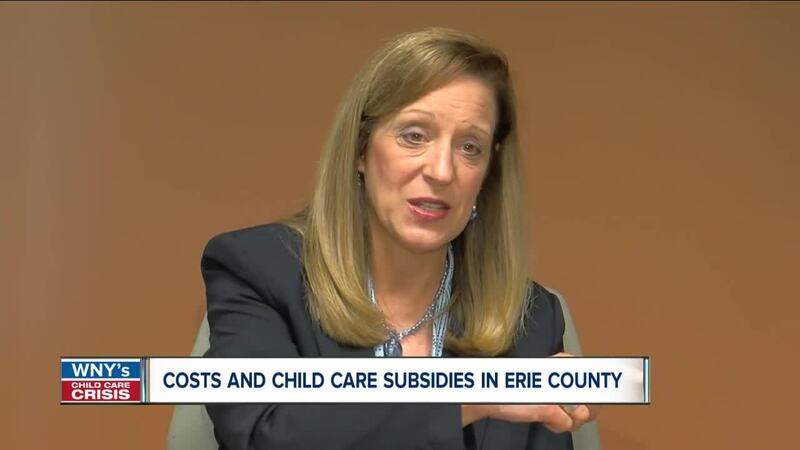 "Erie County had significantly under utilized their funding under a pervious administration, so that will always kind of be stuck with us," Sheri Scavone said. Scavone is the executive director of the Western New York Women's Foundation. She said this problem is cyclical and based on a five year formula. "We will always be in a hole. It's not based on need because it's based on this formulation strategy that goes back in history," Scavone said. Jacqueline Hall is the Erie County Executive Director for Family Independence. She says everyone in Erie County, who applies for the subsidy, is receiving it. There used to be a waiting list. But can we say one administration didn't use the money to its fullest extent? Hall says, "I wasn't here during that time, so I really couldn't answer that question. Based on the five year average, it allowed us to not have as much funding as we would have, if we would have used that funding." Erie County says its doing all it can, capping eligibility at 200% of the federal poverty line. That's the maximum the state allows. State Senator Tim Kennedy is looking to raise that threshold to 275%. That would help more families, but he says money isn't necessarily free flowing. "...it goes through the budget process," Kennedy said. "We have to demonstrate as a state that childcare and allowing families to afford childcare is a priority for the State of New York." If the cap was raised to 275%, the income level would jump from just under $33,000 to just over $45,000. With raising the cap, Kennedy says Erie County residents would get more money in the subsidy. That's something Jackie Roberson supports, so he can provide for his son with some extra help. "...Until daycare stops, that's when you see the end," Roberson said.